OK – well, poetry is not really my thing (mostly because I have never really studied it – and I hope to remedy that some year)…..so I will choose to be a kid for this post. It has been nearly half a century since I was a wee little tyke, and my memory is not as good as it once was, so I am afraid that I do not have a vivid memory of a particular book that I enjoyed when I was younger. I DO remember having a rather extensive collection of “My Golden Books” that my parents often read to me. I loved the colorful illustrations and I liked to pretend that I could follow along as they were reading the words to me. Pushin‘ back the shadow, holdin‘ back the night. Just the whisper on the leaves on the cottoon wood tree. Dreamin‘ after rabbits in a game of hide an’ seek. Right Hand! Left hand! Around you go! Now back-to-back your partner in a do-si-do! Mules to the center for a curtsey an’ a bow! An’ hey there, skinny kid! Show the old cow how! Well, you get the idea. Just recalling the book brings back fond memories and while I do not wish to go back to that time in my life — I am looking forward to one day when I can re-read this book to the next generation. I only heard about Weekly Geeks for the first time today, and you’re the third person to mention it! Next stop, their site. Thanks. Oh, and I think I’ll be trying to find the Barn Dance book for the tots. Thank you, again! You’re the second person to mentio Barn Dance on Weekly Geeks, and I’ve never heard of it before – I’m going to see if the library have a copy! Oh Molly! Barn Dance was the ultimate favorite around here also. 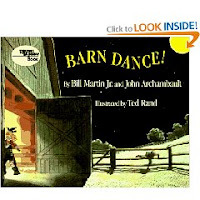 I read so many books to my children, but Barn Dance (behind Goodnight Moon) is always one I remember. My husband has commented recently how much he enjoyed reading that book to each of our four children. Thanks for the memories. I still need to write my weekly geeks post–augh! I am so behind on everything. Mom — I LOVE Barn Dance! I saw it on the book shelf the other night, and it brought back all the memories of when you’d put music to the words of the book. I think it was always one of my favorites, cause it combined music with a book!! Barn Dance sounds like good book! I’ve never heard of that one before, but it sure sounds like it was well-loved!